Under jockey Jesus Osuna, Royal Valedor gets his first win in the Turf Paradise Maiden Stakes trials on Sunday afternoon. PHOENIX, AZ�APRIL 1, 2012�In his 11th career start, Royal Valedor raced to a � length victory and top qualifying time to the $4,000-added Turf Paradise Maiden Stakes on Sunday afternoon. The 10 fastest qualifiers from two trial races will return on the Arizona raceway on Sunday, April 15th and vie for the winner's purse in the 350 yard race. The homebred for owner Ramon Lujan, Jr., is trained by Alejandro Osuna and was ridden by Jesus Osuna. He completed the 350 yards in :18.447 seconds, defeating Featured Glory. Royal Valedor is a 4-yaer-old gelding by Royal Cartel out of the Top Ryon mare Acd Duena. 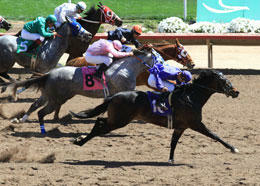 For the complete list of Turf Paradise Maiden finalists, times, sires, dams, owners, breeders and trainers CLICK HERE.